There is no doubt of the importance of social networks in the world today. These websites can play an important role in the daily lives of people across the world. In fact, the use of these networks has become so widespread that a code of etiquette has developed to cater specifically to the needs of social media networks. 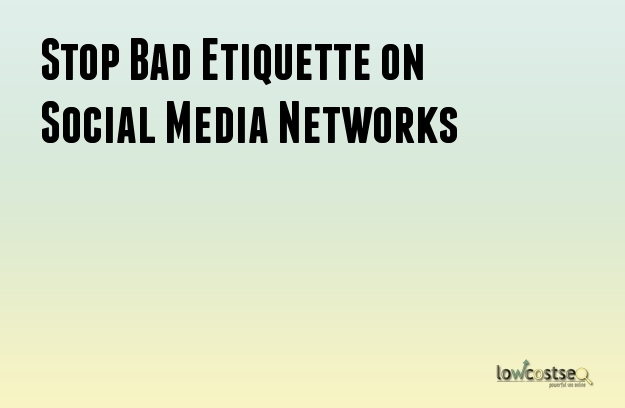 Why Should You Follow Social Network Etiquette? A social network marketing strategy has become indispensible for businesses in the modern world. By leveraging the reach of these networks, it is possible to boost the reach of your own business by a significant margin. However, it is important for you to take the proper etiquette into account while implementing your social media marketing strategies. After all, nobody likes bad manners even in social networks. The fact is that it is now easier than ever to maintain profiles in a variety of social networks. You can easily search and find a program or tool that allows you to post something simultaneously on various social media networks. Even replies can be sent automatically without the need for you to check it first. Unfortunately, this has also increased the instances of spam messages and posts. Anything that seems automated is immediately ignored by visitors and followers. In severe cases, you will find that you are losing followers and readers due to the improper etiquette you are practicing for your social media marketing strategy. You need to avoid certain types of posts and messages while implementing your social network marketing strategy. This looks extremely unprofessional especially if you are posting on behalf of your company or business. People in social media networks will like a post or follow a page if they want to. They will rarely do it because you are requesting them to do so. In fact, many will intentionally avoid liking or following because of the improper social network etiquette that you just showcased. You should instead develop a good page or content that can automatically garner the likes and follows. This is not only unprofessional, it also looks quite silly. You should avoid promoting your page, business or blogs in any place that has no relation to it. This includes forums, message boards and groups. You will not be making any contribution to the discussion with the post. In fact, your posts can be considered to be a form of spam and penalties can be levied. After all, if people are discussing about food, they will not be interested in knowing about the benefits of your clothing brand. This is a common mistake. If you type the entire message in capital letters, it can seem as if a child has made the post. Of course, capital letters are used to denote exclamations and screams. Therefore, people will be wondering why you are shouting. Instead, you should use the proper format, grammar and punctuation to get your point across. That will give a good impression about your business.